Well things have changed remarkably since then, but I can still reclaim that feeling as I settle back in to the atmosphere. Boone will always be home in many ways, even after everyone I've ever known has moved away and when a much longer span of time has past, this will still have a part of me captivated. It is one place that, regardless of the ridiculousness that often ensued in those naive college days, will always make me feel whole again and remind me I always have my little corner of the world to rest and just be. I've ventured to many new locations, seen many beautiful cities and scenes, but there is something spectacular about these mountains that grab me in a unique way. The beaches of the Canary Islands that I recently returned from have incredibly blue water and breathtaking views; the five towns of Cinque Terre, Italy adorn the vast green hills and traditional, modest, colorful homes; iconic landmarks fill the streets of Paris and Rome. 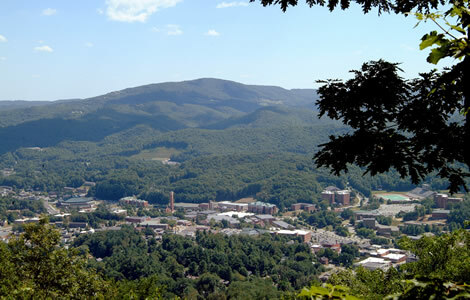 But there is something enchanting and timeless about these Appalachian Mountains. And as much as I run off in search of my next place to call home, a new city to embrace, and as long as I seek out new awe inspiring images offered all over the globe, these mountain ranges and humble towns will never fail to impress me and leave me feeling refreshed. It's my own personal connection that seems to only ripen with the years. I love this town, this school, and these mountains, and I will always return to it, no matter how much it changes or what new places I venture off to.